The Blessed Nest: Beachy Bottles -- You Can Fake It Too! Beachy Bottles -- You Can Fake It Too! y'all are just going to go gaga over this one! I'm sure somewhere you've seen a version of these pretty shells soldered on a vintage bottle. The pic below is from Wisteria, and a set of 3 bottles (you don't know what bottle or shell you're gonna get) costs a whopping $149.00. Love the look, don't love the price. So, I decided to try out a version of this for myself using what I had on hand! Hot glue shell to top of (or just inside lip of) your bottle. Don't worry about it being perfect, the hot glue is just gonna get covered up soon anyway! Cut a length of your jute twine and wrap it around the lip of the bottle, hot gluing as you go. Keep wrapping & gluing up toward the base of the shell. Glue and wrap till you meet the base of the shell, trying to cover any left over gaps on the top of the bottle, and then finish twine off in the back side. Add a few tiny shells for fun if desired. I personally think that the jute adds a fun coastal feel to this project! Perfect for Summertime or Anytime!! Display your pretty Beachy Bottles anywhere....on a shelf, grouped as a centerpiece, or next to the tub! You can't go wrong :)!! The beauty of hot glue is that it can easily peel off the bottle and shell for when you want to do a different project! I hope that you like this fun & easy project! I love it with the jute much better! Very clever and a beautiful project. Will have to add this to my every growing wish list of things to do. Great idea. Now I just need a few bottles. Oh you clever girl you! LOVE IT! I actually like yours WAY better!!! :) Very, very cute. What a generous "share"! I love this idea and I think I can actually do it! Please do copy me!! :) That's the fun of sharing stuff on blogs! E-mail me a picture if you do, & I'll post it! Crafty girl! Love this project! That is BRILLIANT....and a MUCH MUCH better price!!! Those turned out GREAT!!! I am wanting to "beach" up my house a bit for the summer so I may try these. I'll see if I can come up with some bottles. LOVE your version....thanks for sharing! Thank you Stacey - I already have everything I need for this project. Deff. going to give it a try. Thanks again. Oh yes that is a great beachy project . I am so making these!!! 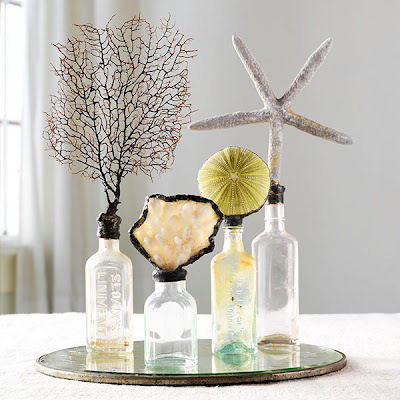 Oh what a nice beachy project to add as an accessory in your home. I love it! Your version actually looks way better than the one in the fancy magazine. I love this. I am trying to move my decor in the beach decor direction. I just may try this. Love the shell idea! What fun:) How is house stuff going for you? We have a contract on ours and we'll be moving the 2nd week in July... We're both really excited! I love this idea and like your version MUCH better! Thanks for sharing!!! Adorable. I love it! You are so clever. HANDS DOwn this is my favorite!!! Oh my gosh I am dancing around about your brilliance!!! did I mention how brillian?t you are!!!! I love those. You have inspired me. :) Thanks! Adorable!!! I thought so too when I saw the ones from Wisteria. Thanks for this. I love your beachy bottle project, it turned out gorgeous! Do you think anyone really pays those outrageous prices for some of that stuff in the Wisteria catalog? I love looking through it for ideas but $149 for bottle(s)? I don't think so!! Love these..., and will be featuring your project in part two of Bloggers Craft! (Sometime in the future). Oh these are GORGEOUS! Thanks so much for sharing, I'll be linking. Hello! Stopping over from Kimba's Great job! I especially like them with the books and larger sea creature! Wow! I love it! Yours are so much BETTER than the stores. I'm feeling inspired! I like that the jute makes them more summery than the solder. I have seen these in Beverly Hills for $$. Way to go! Stacey, I have seen these! Your version looks SO great, what a cool project. Super Duper AWESOME!!! I may have to go to the beach next week. I think yours are much cuter that the spendy ones! Thanks for sharing the idea! What a great idea! These turned out better than the original I think! Love this idea, can't wait to try it with the tons of shells I've got stored away! Thanks for sharing. LOVE this project...you did a wonderful job, very creative...definitely gonna try this one! You have a very nice blog and I've enjoyed visiting here! Love this project! I'm going to mention in on-air tonight :) www.blogtalkradio.com/inspiredathome Thank you for the inspiration! I absolutely love this brilliant idea! Thansk so much. I put a link to it on my blog. Found your blog through Great Full Day. This is a great project! I bet you could make them look like the Wisteria version with some black wax and or black hot glue - but yours have a more beachy, casual feel. Sun, Sand, & Sea...It's The Life For Me!